Apple (s aapl) spends a whopping $28 billion a year buying semiconductors for the millions of tablets, phones and computers it produces, according to estimates released from IHS iSuppli, a research firm. That makes Apple far and away the largest buyer of silicon, ahead of No. 2 Samsung, which buys $14.9 billion. It’s a huge number, more than the total number of chips sold in a given month, but to really drive it home, I pulled the estimates from the Semiconductor Industry Association and the World Semiconductor Trade Statistics (WSTS) Spring 2012 global semiconductor sales forecast, which projects that worldwide sales will hit $301 billion this year. Thus, Apple is expected to buy 9.3 percent of the chips sold throughout the world this year. That’s a lot of phones and tablets. It’s also more than a May estimate by IHS iSuppli that predicted Apple would spend $27 billion. But rising sales of devices are not the only reason Apple purchases so much silicon. It also has to do with how it has designed its devices, using separate application processors, which are the brains of the phone, and radios. Qualcomm (s qcom) offers an integrated processor in many top phones, which combines multiple chips on one system on a chip. Still Apple’s success in consumer goods and the growing number of chips inside those goods are driving this trend. Apple is set to expand its lead in global chip purchasing next year, with growth of 12.3 percent once again leading the Top 10 OEM semiconductor purchasers. Meanwhile, the SIA and WSTS believe global semiconductor sales will grow 7.2 percent next year ($322 billion in total sales). So Apple will continue to grow at the expense of others. This sure looks like a flawed article to me, starting with the title. If Apple spend’s 1/10th of the total dollars spent on semiconductors, how does this equate to “buying 1 out of 10 chips sold this year? Several of the chips Apple buys are very expensive. 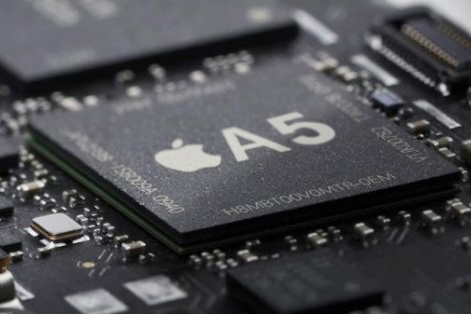 There are many other chips that Apple does not buy that are orders of magnitude less expensive than say the LTE chip from Qualcomm or the A6 chip manufactured by Samsung. There is no debate that Apple is by far the largest single buyer of semiconductors based on dollars spent. Dan G. about the comment on litigation. Litigation is necessary to protect one’s ideas, products, and what one might be planning to do in the future. I agree that it is sad it has to be done, because it is a waste of resources. Apple does not get all of its chips from Samsung and even if it did, that would not be a reason the phones or tablets look alike. People tend to copy success. The MacBook Air is an example. The Mac OS is another example. Steve saw it at PARC, but he did not steal it. Microsoft did not steal it from Apple. However, they all share features that are similar – very similar. The chips inside of the iPhone to do not make it look like a Samsung product or vice versa. I have followed Apple closely since before 1984. Instead of buying the computer, I first bought the stock. When you see a good thing buy it, emulate it, come up with a better idea, adopt it, but don’t just steal it. We are in for an interesting couple of years. Apple has a “ton” of money. Enough to do anything they can dream up. Chip producers will have a difficult time manufacturing what is on Apple’s drawing boards and in their mind(s). Samsung does not have the cash that Apple has available. They do not have the ideas either. With regard to the recent stock drop: the analysts missed it again ! Apple did not miss it. Think about this. The analysts are always trying to predict what Apple is going to do. They don’t know jack to be blunt. Apple does not release ahead of time what they are going to do or sell. The economic models are too complex for someone outside of the company to be really accurate. Analysts are always predicting; so, salesmen can sell you and I stock based upon predictions. It happens for every business. Can you tell me how much electricity is going to be used tomorrow in the state where you live? What about next Wednesday between 2-6 PM ? There are very sophisticated models for this, but it doesn’t matter what MWHs will be consumed – not really – not to you or to me. Maybe to the power company, but they are not going to tell the public. If Apple does nothing but invest its money and pay its stockholders, they will do better than most companies. When you have a couple of boatloads of money and you only need one to get there is my point. I can hardly wait to see what Apple and the Competition produce in the coming years. Look where they have all come from. Look what happened in the auto industry. Hyundai did not get there by thinking inside of a box. It is much easier to use a wheel than it is to invent one. Enjoy this time. The best is yet to be. Just a question do these numbers include what Apple produces at Samsung which is the processors for both the iPhone and iPad? If not, Apple is consuming about 11% of all semiconductos in the world not 9.3%. Apple is litigating instead of innovating, since, instead of conquering, the iPhone lost the smartphone war to Android. Rerun of the Mac losing to Windows. 80 million overwhelmingly Windows PC’s per quarter. Samsung likely sold around 50 million smartphones in the 2nd quarter, On Apple’s side, just 26 million iPhones, 17 million iPads. No wonder iPhones look like Samsung phones, Apple even buys its chips from Samsung. The only growth that’s gonna happen is Apple’s patent trolling.